Anyone who remembers Saturday matinees with comic swapping sessions, and being given the ‘funnies’ comic strip section of the newspaper on a Sunday, will understand the concept of a Benday dot. Those of you too young to remember the comic book era, think of the cyan, magenta, yellow and black dots made by an ink-jet printer or look closely at most modern printed matter and you’ll be seeing halftone dots… the close brother of the original Benday. With Roy Lichtenstein’s retrospective showing at the Tate Modern right now, Benday dots are going to be as commonplace as freckles in summer. The dots fool the eye into seeing an infinite range of different shades just like the Pointillists did when they placed yellow paint next to blue to read green. The Benday dots had a slightly crude look. In early comic books the dots showed clearly against the cheap paper and sometimes when misprinted the images were annoyingly blurry. The dots are named after Benjamin Henry Day whose father was the founder of the first mass newspaper in the US. They allowed an illustrator to rub the dots from a pre-made sheet directly onto their original artwork rather like Letraset. 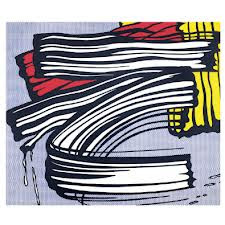 Lichtenstein’s first cartoon image was a result of his son challenging him to paint Mickey Mouse. Not all of us rise to our son’s challenges quite as well. The painting from 1961, hangs in the Tate exhibition with the faces of Mickey and Donald Duck dotted in with a paint-covered dog-grooming brush. 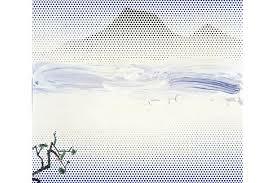 The breakthrough came when Lichtenstein created his own stencils for the dots. In his early images he painstakingly replicates the look of the popular comic book right down to not lining up the colours so a white space shows or to mis-registering the dots to create optical illusions that make the image shimmer. He was copying but restating the copied thing in other terms. 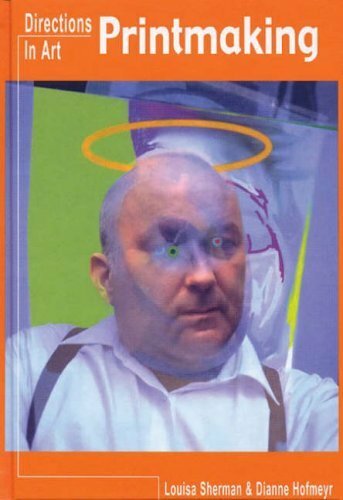 Along with Richard Hamilton and Eduardo Paolozzi in Britain and Andy Warhol in the US, he became part of the Pop Art movement. It’s aim to deal with things that were everyday fitted with his own. Ordinary objects from the supermarket and the American soda-parlour like the sandwich, the frosted glass with a paper straw wrapper, and the roasted turkey were some of his themes. His Brushstroke series can be seen as a parody of Abstract Expressionism where the brush marks on the canvas were all important. He gives the impression of the paintings being executed with sweeping gestures, paint dripping, extraordinarily free and fluid, as if a large paintbrush has been swept across the work. But don't be fooled... in 'Little Big Painting' the ribbon-like strokes of colour are carefully planned even though the surface has the freshness of a quickly painted canvas. Each stroke is painted in... ironically without any sign of brushwork in the flat colour of the so-called brush marks. In all his work, whether reproducing a comic image, or reassembling an image made famous by other artists like Picasso, Matisse and Monet, he seems to be suggesting in a playful way that art as the spontaneous expression of an artist’s feelings can also be a very controlled act. Get to the Tate Modern quickly before the momentum builds up. Go early to avoid the crowds and choose a Tuesday if possible. Apparently it’s the quietest day. Take time to look up at his three dimensional constructions of explosions. Take a notebook and expand his stories. No cameras allowed. You’ll find yourself smiling at the energy of it all... and maybe feeling a bit quietened by the mystical tones of the last room when death was just around the corner for him. I went on the coldest day of this year and came away warmed and happy. And you’ll never look at a piece of gridwork sheeting with perforated holes in the Underground, or anywhere else again, without imagining how Lichtenstein might have put it to use. Oooo, I wish I could go! But until somebody moves London someplace more sensible, I'll make do with your excellent post - thank you! Fabulous post! Thank you for giving his comic book art a context - even if the show is way down in London. Did you see the BBC4 doc on this? I loved artist Dave Gibbons' attitude: the original comic panels are better art, while being valued in ££ far less. I believe he is right. Comics are narrative driven and the art within is always more dynamic as a result. 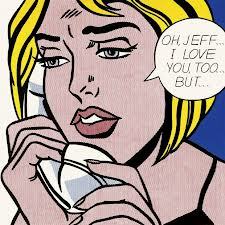 Lichtenstein was a rip-off merchant, but a very good one. Super post, Dianne Thanks so much...had never properly appreciated his art before! Learned a lot! Sorry this was posted while I was out of the country. But yes David I did see the BBC 4 doc the night before I left. I thought it was brilliant and loved the debate on the comic issue whether the original artwork was more dynamic etc. I thought the whole program had an interesting slant. Great to have varied opinions.